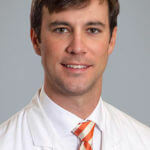 Dr. Spence is certified by the American Board of Orthopaedic Surgery. He is an assistant professor at the University of Tennessee-Campbell Clinic Department of Orthopaedics and serves as an active member of the Pediatric Orthopaedic Society of North America, the American Academy of Orthopaedic Surgeons, and the American Academy of Cerebral Palsy and Developmental Medicine. Dr. Spence has contributed to multiple textbooks and is actively engaged in research that has been published in many peer-reviewed journals. He specializes in pediatric and adolescent sports medicine, pediatric and young adult hip preservation, trauma, deformity correction, neuromuscular disorders, and spinal deformity (scoliosis).